BRUSSELS – France, Germany and Finland are pushing for a financial transaction tax to be implemented in Europe, despite the ongoing opposition of European countries. The implementation of an international tax on financial transaction encountered another roadblock on March 13th in Brussels at a meeting of Finance Minister of countries in the EU, as ministers still cannot reach an agreement on whether the tax should be instated. Throughout the meeting the Finance Ministers of France, Germany and Finland continued to rally in support of the tax, with the ministers of each country saying that the proposal has the full backing of their governments. Italy, which had previously put forward its backing for the proposal, now voiced some caution, with the Prime Minister Mario Monti saying that he agrees with the general principals of a European financial transaction tax but he also thinks that more discussions are needed before any joint decisions are taken. The financial transaction tax faced the strongest opposition from the Finance Minster of Luxembourg Luc Frieden and the Finance Minister of Sweeden Anders Borg, both of whom voiced their adamant opposition to the proposal. The Chancellor of the Exchequer of the UK George Osborne did not attend that meeting, but the UK government gave no indication that it had warmed to the idea of a transaction tax. Responding to a suggestion that the tax could be implemented in a small selected group of European countries, the German Minister of Finance Wolfgang Schaeuble explained that at least 17 nations would need to participate in such an treaty in order for it to be effective, and, ideally, a financial transaction tax should be implemented globally or at least in all EU countries. 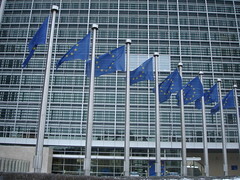 While addressing the Finance Ministers at the meeting, Wolfgang Schaeuble said that the EU cannot delay implementing the financial transaction tax, and if a solution cannot be reached soon then work will need to get underway to find an new means collecting additional tax revenue in Europe and stabilize international financial systems.